Gigi Hadid has been making the normal supermodel rounds during New York, London, and Milan Fashion Week. Sure, she's walking on designer runways (including in her very own Gigi Hadid x Tommy Hilfiger show), but she's also out and about attending ritzy celebrity events. This means we get to see more of her hair and makeup looks than usual. And we love it, not just because she's one of our time's most influential It girls, but because she regularly surprises us with bold new looks. Maybe it's the fact she's consistently surrounded by the industry's top experts or that she has a long-running ambassadorship with Maybelline, but whatever the reason, she never has a bad beauty moment. Take, for example, one of the last looks she wore during London Fashion Week, when she stepped out wearing icy white eyeliner in lieu of the traditional (and expected) black. As you can see, she paired her crisp white cat eye with a monochromatic fashion ensemble. The bright blizzard color paired with her sleek pale-gold hair gave us ice queen vibes (in the best way possible). This isn't the first time Hadid has experimented with white eyeliner, either, though each time before she has supplemented it with a base of black. This is the first time we've seen her fully commit wholeheartedly to the '60s-inspired makeup, and we love that it. In fact, we love it enough to try for ourselves—after all, Hadid makes it looks surprisingly wearable for day-to-day. 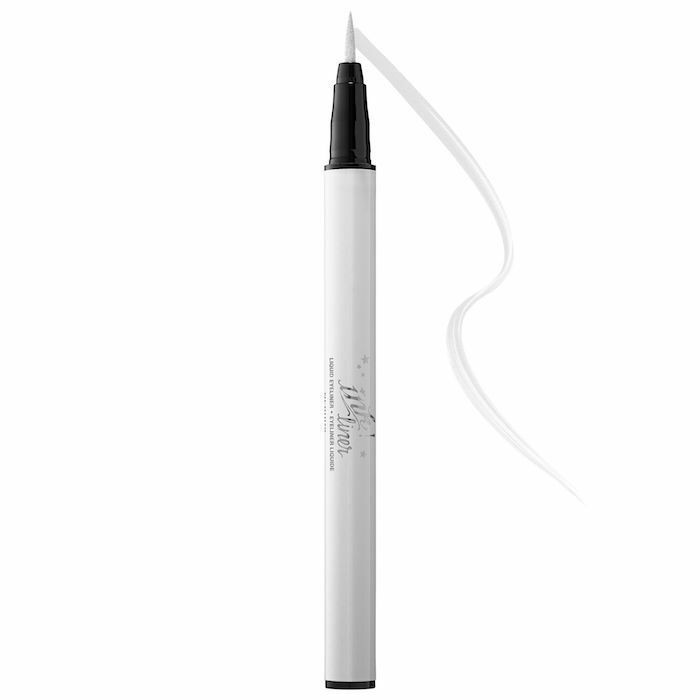 We'll go for this white liquid liner from one our favorite vegan and cruelty-free brands, Kat Von D. This liner has a felt tip that deposits pigment smoothly, while the tapered end allows for a super-sharp flick. Plus, it promises 24 hours of smudge-proof and fade-proof wear. If you look at Hadid's photo closely, it appears that she wore the white liner on a base of light-pink eye shadow. The combination makes her green eyes pop (and we're always down for sporting pink lids). Try MAC Eyeshadow in Expensive Pink($16), which is a slightly peach-toned color with a gorgeous shimmer finish. Next in unexpected eye makeup looks, see Margot Robbie wear neon yellow shadow (and look amazing the whole time)!